‘Scope-creep’. noun; coined by Doug and Michelle Hamilton. 1. The enactment of the unconscious expansion of projects. Often, but not exclusively, related to marine projects. 1a. An affliction highly contagious amongst sailors of all races. Applications: ‘suffering from…’ resulting in delayed launch-time, increased wallet-lightness, and boatyard insomnia. ‘the … got him in the end. He’ll have to wait til next year to leave.”It would have been OK if his scope hadn’t crept…’ Not to be confused with ‘Anchoring Scope’. After many days of tweaking, this morning finds us in Chamblins rambling massive bookshop/cafe in downtown Jacksonville. Nearly six weeks of 90-100 degree boatyard temperatures, where the only air-conditioning is in the tiny, smelly toilets of the yard, is making us love the cool, erudite and fun atmosphere that Ron Chamblin cultivates here. Coffee in the Street outside Chamblins Bookstore, Downtown Jacksonville. 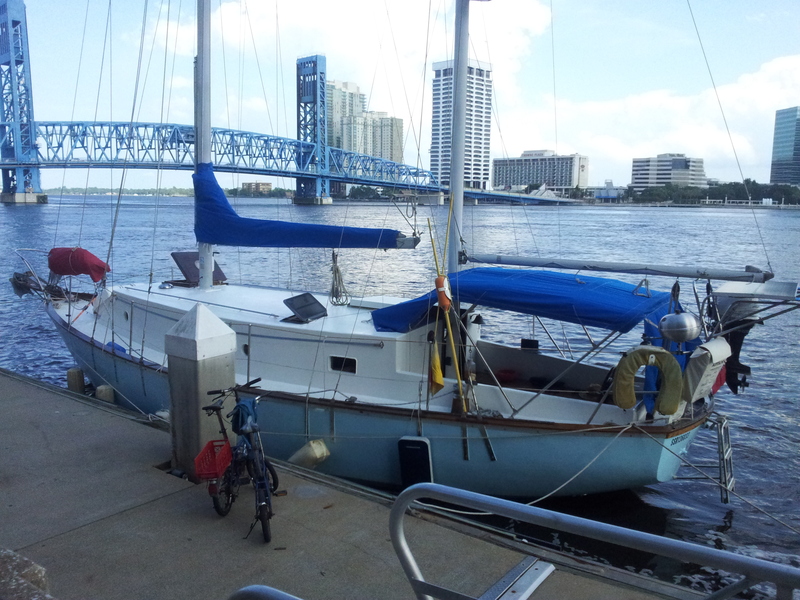 At 7pm, after a beautiful, sunbleached sail down St Johns River, we pulled gently up onto Jacksonville landing – the city’s free municipal dock in the middle of downtown ‘Jax’. It was a perfect journey, after a nightmare morning. Departures are never easy, even after a few days, and Sandpiper has been in Green Cove Springs Marina for nearly five years. A lot accumulates over that kind of time. At the last minute, we discovered we had a grommet missing from our hand-built Dudley Boycott mizzen sail, and there was a flurry to fix it. The absence of that not-inconsiderably-sized sail did not cause us to make less than five knots, though, from marker buoy to marker buoy, and under the tall Interstate bridges into ‘Jax’. She’s a fast boat, but I always forget her pedigree when she’s been in the yard for too long, with ferro-cement doubters casting aspersions. But as the finishing touches have gone onto the boat, and we are starting to polish up the brightwork, and varnish the teaks, it has almost become a point of embarrassment how classic and hand-crafted the boat is. As always, these touches only occur at the end of the project, and are the easiest bit, but have the biggest visual impact. What with hot water for cleaning the now spotless engine, itself so solidly mounted on its steel bed, with a nice shower in the cockpit, the bilge pumps automatically pumping, the batteries quietly solar-charging, and the the hull spotless both outside on the curves, and inside – in the very dirtiest corners of the bilge, she is an efficient boat. But one cannot help being satisfied, too, by the pretty transom, shining stainless, deep varnish and warm bronzes of the old classic. A combination of Chesapeake’s best – Hull designed by Olin Stevens for famous and repeated wins in ocean races in the ’50s, superstructure designed by generations of Chesapeake ‘Skipjack’ fishermen. She’s a beauty, and there are no two ways about it. The new engine purred like a kitten, the prop spun nicely in its perfect alignment when the the engine was at rest, suggesting an extra alternator installation on the shaft at a later date to make ‘sail powered electricity’. It was nice to retrace our path on the GPS, too, and remember how it was coming into Green Cove – how we had docked in the town to start in a force eight blow, with three inches to spare on each side, and two inches under our keel. We have lost a lot of self-belief over these years, and during our darkest hours woken in the middle of the night with the worst possible ‘yard-fear’ and ‘scope-creep’, and wishing to somehow end it all. Finally, it is suddenly another world. We are water-borne again, with our perfectly functioning home ready to take us anywhere on The Planet. WE BEAT THE SCOPE CREEP!!! This entry was posted in Maritime on 5th August 2014 by Rupert Allan.